In just the first two pages, Hogarth establishes that this is another world (with three moons), that Angharad can fly (her wings were injured in the battle for Glendallia; also, “A warm breeze presages spring and sweeps my fine hair off my shoulders, tickling my wings.” – Angharad wears a backless blouse with breeches), that the creatures of this world can interbreed and do not look like each other, and that the royal court is REALLY anxious for the politically inexperienced Angharad to take command of the large province of Shraeven (until recently an independent kingdom) as soon as possible. She is promised all the additional troops she wants, a new support staff, an almost unlimited expense account – but she, personally, has to be the new Governor. Angharad suspects that the “newly pacified province” is in fact a hellhole, and that she is expected to fail – but who wants her, personally, to be a scapegoat? Of important added interest, there are constant references to this planet’s unique biology. And all the above is just in the first chapter! This all results in a novel of political intrigue in which the Furry element is especially important. There is no human vs. Furry conflict; everyone is a Furry of one kind or another, with many more blends than Earth has species. It is almost immediately evident that in this context, “man” means anyone who is sentient. This first half of a novel has been revised from a collaborative serialization that Hogarth published on LiveJournal from October 2003–June 2009. 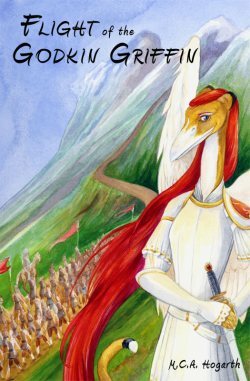 This journal is a work of interactive fiction about the travails of a griffin military commander, and is updated 2-5 days a week on weekdays. If you'd like your vote to help direct the story, become a Godkin patron by following the link on the User Info page and donating. Check the Godkindred website, linked above, to catch up with the Story so Far. Hogarth has smoothed out this first draft into a finished novel, or the first half of one. Please, hurry and publish the second half! I gotta say it is extremely difficult to tweak vocabulary for anthropomorphic fiction so that it doesn't overlap with terms that are tailored toward humans or one's own experiences in this universe. For example the phrase "He was a good man" came up when I was writing and it's a common phrase but since the person who died wasn't a "man" as in male human I went bzzzt try again. After a little that one was easily tweaked to "He was a good spirit". More challenging was the story was on a different planet and I had to describe a sun rise... where's the challenge in that? Well, it's like a game of taboo... I can't use the word "Sun" because the "sun" isn't a word used to describe the star in the center of every universe, it is used as a specific name for a particular star we are most familiar with. So yes I could use the word sun, but what are the odds that an alien culture would come up with the same name for their star as we ours? So I simply called it "the fire in the sky" and used other metaphors to avoid giving it a name, which was a bit more difficult. Sci-fi and furry writing definitely provides a challenge to ones vocabulary and understanding of societal definitions and etymology if one tends to over-think things. In my work (most notably in By Sword and Star), I often use "man" or "woman" to simply indicate male or female character, instead of assuming that the terms automatically mean "human." I don't see a problem with it, especially when there aren't any humans in a story's world, but apparently it trips up some readers who take things very literally. *shrug* I'm all for using appropriate idioms and such (I remember critiquing a story where a zoomorphic fox talked about 'learning the ropes,' which didn't make much sense from a real-life fox's perspective), but at some point you do get into the calling-a-rabbit-a-smeerp type problem, and it becomes overblown and distracts from the story you're trying to tell.